I have worked to put together a word wall using all of the tips and suggestions I recently learned from Debbie Diller. 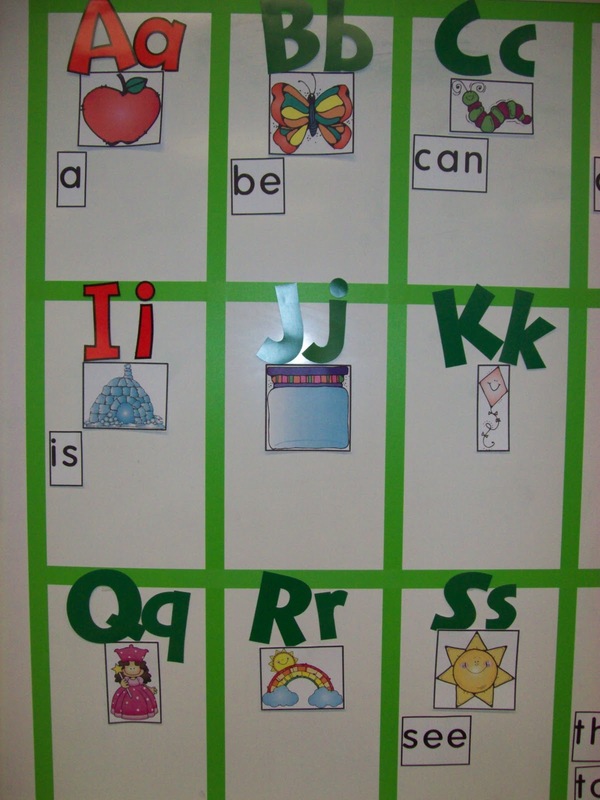 1) Make a border or a grid for the letters and words to go in. This is based on brain research she is reading about and how the brain sees in borders. 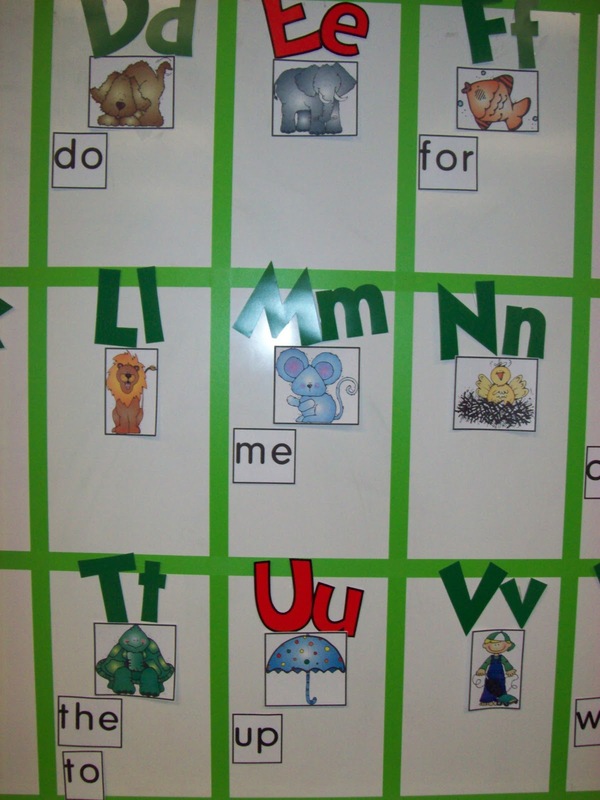 2) Make the vowels one color and the consonants another color. 3) Add a picture for the beginning sound of the letter. This applies to lower grades. 4) Make the words on the word wall in black and white. The words are easier to see this way and it is a common color for words in print. I decided to put a border around the individual words based on the brain seeing in borders idea. The materials I used to make the word wall: I used colored "Dorm Tape" that I found at the teacher store. It is similar to colored masking tape, but it is supposed to stick a little bit better than masking tape. The letters are made by Trend. They are the 4inch Venture pack. I created the picture cards using DJ Inkers and Thistlegirl clipart. 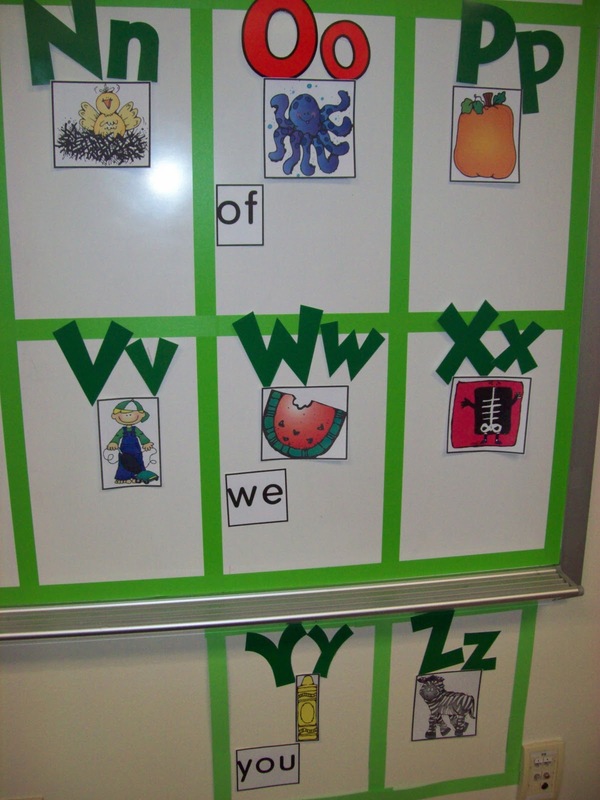 Here are a few close up pictures of the word wall. Here are the pictures I made for the beginning sound cards. 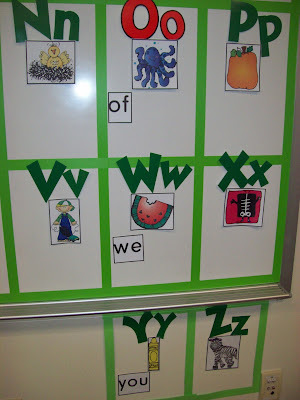 How do you feel about word walls in preschool? I love how you applied what you read in Debbie Diller's book. Your post was so easy to understand too and you took me step by steps through your thoughts. Thanks...you made me think deeper today. 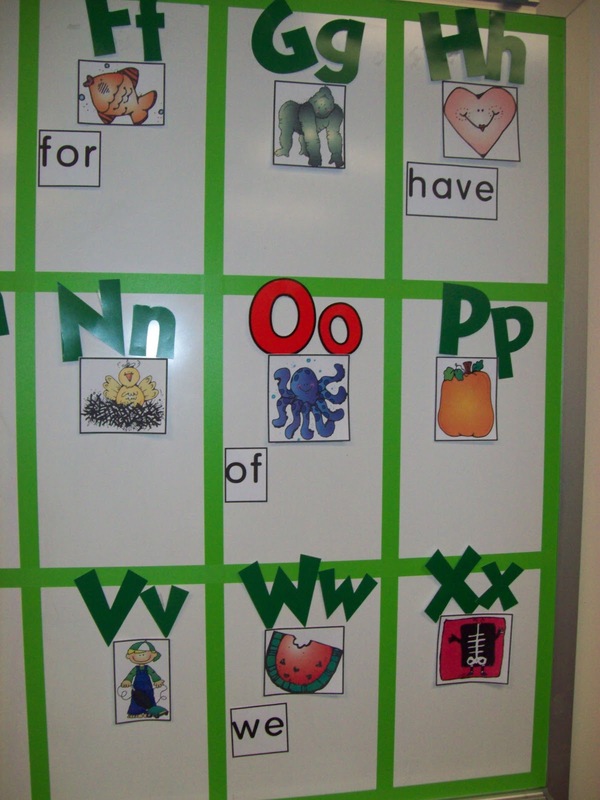 I saw a pre-k word wall that only had letters and pictures for beginning sounds on it. It was more of a sound wall. They had color coded the letters so that all of the capital letters were one color and the lowercase letters were another color. 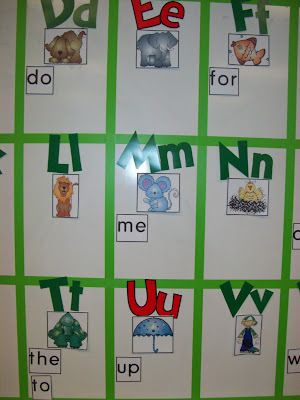 If I added words to a word wall in pre-k, I do not think I would put very many on it. Thanks for sharing your ideas and Debbie Diller's ideas about word walls. It makes sense to have the dividing lines. I have my word wall on my storage cupboards and it would be a lot of work to add dividing areas...but I will think about it. I recently saw making a word wall that kids can come and take the word to their seat to copy which makes a lot of sense to me. I think putting student pictures with their names on a Pre-K word wall would help kids with letter identification. I certainly don't think I would get carried away with a Pre-K word wall. THANK YOU for sharing the beginning sound pictures! I am definitely going to add them to my word wall!! Greatly appreciated!! Thanks for the beginning sound cards!! I will be adding them to my word wall! Thanks again! Thanks you for sharing this information and including the picture cards. I love your blog! I read her book this summer. The best takeaway I had from it was to surround my whole group carpet area with bookshelves. Not only are we surrounded by text as we talk about it, but it saved an entire area of space in my room! Lots of compliments on it and much better for the space we're working with! Oh.My.Goodness. Thanks for sharing all your hard work and information you have learned. You are amazing!!! I have a question for you! Do you know if that tape peels off easily from the white board? I would love to copy your word wall and my whole group area is surrounded by a white board. I can easily do this but am afraid to ruin it! I actually had to pull it up a few times when working with it and it was very easy to do. It has a good stick, but it pulled up and moved very easily. Love this idea! I was wondering what you did to make the words. Thanks! I used the program word to make the words in. I used the font Howie's Funhouse. I got it as a free download. You can search it on Google. Then I put a thick border around the word. I did this under format. I hope this helps. Let me know if you have any questions about my explanation. That does help. What size font do you use? Thanks! I am curious what you will do when the space fills up? I love the look of your board and would love to use the idea. I have 150 words on my board by the end of the year. 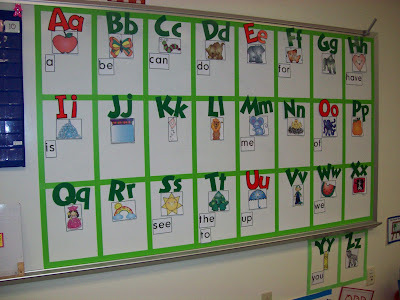 I am researching ways to improve my word wall and stumbled upon this post on Pinterest! I love your initial sound cards but am unable to download because I don't have a Scribd account. Are you willing to share the PDF? Thank you for the great ideas of the initial sound cards and borders! 1. What is each square's dimensions? __ x __? 2. How did you put the alphabet letters on the board? Ticky tack? Hot glue? 3. Do you think painters tape would be sufficient? I'm unsure what this type of tape is you're referring to!? Thank you SO much!!! Because of your beautiful blog I might actually have a great word wall this year!!!! I did not start out with exact measurements. I measured the space I had to use and then divided it based on that. I used packing tape to put the letters on the board. I think some brands of painters tape are better than others. I used a dry erase board so the tape worked well. The tape I used was very similar to painters tape. It pulled off easily but it also adhered well. The tape I purchased came from a teacher's store. Great ideas-thank you! What sight word list do you use? Thank you for such an excellent representation of my work. Hi! I love your word wall pictures! Thank you for sharing this great idea! I was just wondering if you have a TPT site that I could download them from as I don't have a Sribd account. If not, would you be willing to send me a copy of your sound cards? I would love to make a word wall like yours! Thank you! I had success with just copying and pasting the pictures into a word document. I didn't need a scrib account. What did you use to get the letters to stick to the dry erase board? I have had an "interactive" word wall for several years now. I use half of my magnetic white board for the space and apply magnets with a hot glue gun to the laminated words and letters. The students love to be able to come and grab a word from the word wall when they are creating and writing text. So easy to put back and encourages and employs alphabetical concept-thinking. I have a small stool that stands in front of the board for words at the top. I will be employing this useful idea of borders this year. I love this word wall! Thanks for sharing! Did you have to purchase 2 packs of letters in order to get the different color vowels, or did the set come that way? It's so sweet and useful. You know you have great ideas for children. A SUPER FUN Way to Label! !